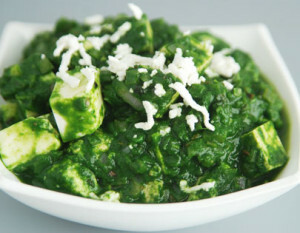 Palak Paneer: Many of the best loved vegetarian Punjabi dishes are the ones where paneer is combined with a vegetable. Palak paneer is a thick sauce based on pureed spinach, with garlic and garam masala. It’s a well-liked eater dish. Palak paneer is one sort of saag, which may even be created with mustard leaves. It is tasty and quick to make. Clean and wash spinach under running water to remove any soil or impurities. Blanch the spinach in boiling salted water for 2 minutes. Drain excess water from blanched spinach. Transfer blanched spinach to the medium size jar of a mixer grinder. Add in green chillies and 1/4 cup water. Grind the mixture until smooth puree. Stir fry till golden brown. Add in the chopped ginger and garlic. Add in the paneer pieces. Stir for 2 more minutes. Serve palak paneer with hot with roti or naan. If you have any queries regarding the Palak Paneer recipe, please leave a comment.